I am joining up with a bunch of other bloggers to celebrate National Burger Month. This fun party is hosted by Kita of Girl Carnivore and does she have a great event planned!! Kita has lined up a whole slew of sponsors and is giving away one prize package each week during the month. Those winners are then put into another grand prize drawing where they could win a gas grill. You can enter each week. 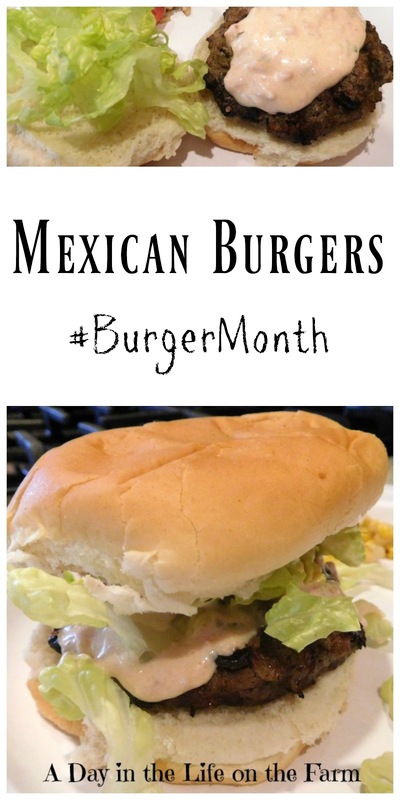 I have a link for this week at the bottom of this post but you can always go to #NationalBurgerMonth and enter during the next weeks. 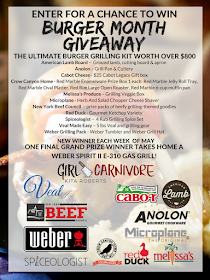 All Kita asked of us was to create a burger of our choice to share with all of the readers and give our loyal readers an opportunity to win one of the great gifts being offered. You will find a list of all the prizes and the entry form at the bottom of this post. I can't wait to see all the burgers created. There will be 1 or more posted each and every day this month. Look at all the bloggers who are attending this party. That, my friends, is a lot of burgers. Since yesterday was Cinco de Mayo, I have been in a Mexican Mood and developed a burger chock full of Mexican Flavors that I topped with a Mexican Thousand Island Dressing that I developed. The patties are lean ground beef raised on my friends, The Ruemenapps, family farm. Their beef is raised humanely and pasture fed. I combined this amazing beef with some green chiles, salsa, onion, garlic and crushed corn chips. Then I turned them over to my husband who grilled them to perfection. We were celebrating his and our daughter's birthdays so the recipe I'm sharing makes 16 burgers. Feel free to reduce the amounts according to your needs. I put out all the normal toppings: lettuce, tomato slices, onions, cheese, pickles and avocado slices. I also made up a delicious dressing made of Avocado Mayo and Salsa that was reminiscent of Thousand Island. I also had a platter of Tex Mex Enchiladas, a brown rice and black bean salad and a grilled corn salad, both of which I will be sharing on another day. There were 14 people including our Little Miss who ate some of her Mama's burger. Our daughter Nicole and her husband, Pierre, are not meat eaters so they stuck with the Enchiladas. That leaves 11 people and 16 burgers. Not a burger was left when dinner was over. These burgers are filled with Mexican flavors and then topped with a Mexican Sauce reminiscent of Thousand Island Dressing. Place the ground beef, chiles, onion, garlic, eggs, salsa, tortilla chips and pepper in a large bowl. Using clean hands, mix until well combined. Divided into 16 equal parts and form into patties. Heat a grill to med high heat. Cook the burgers for about 10 minutes per side for medium or to desired temperature. While burgers are cooking, combine the avocado mayo and salsa. Place the burgers on the buns and top with the Mexican Dressing and any other desired toppings. This dressing is also perfect on Southwest or Mexican style salads. 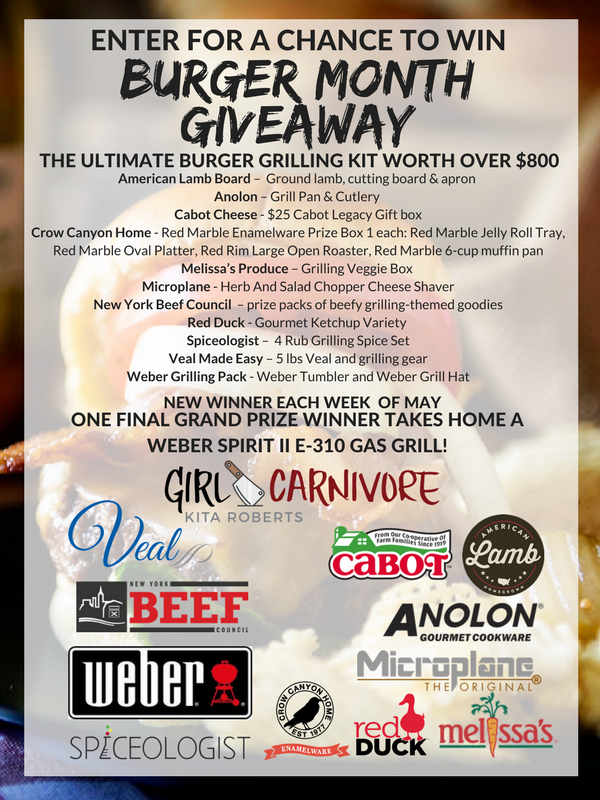 Don't forget to enter the amazing giveaway and follow #burgermonth on social media for more amazing burgers. The links to the bloggers above will take you to their home page until their burgers are made at which time I will change the link to their recipe. They were gobbled immediately Renee. I love all of the flavor you packed into these! My husband is going to really love them too! Thanks Carlee. They were a huge hit here. These are right up my alley! Love anything with chiles! They were very tasty Karen. I LOVE that sauce on your burger! I'm going to have to try that on mine. Looks delicious! Thanks Sandi. It has been a great event.